When medical researchers report that they're hot on the trail of a major breakthrough, it's generally pretty easy to understand why they're excited  and why you should be too. With particle physics, it can be a bit tougher. Earlier this week, word began spreading through that rarefied community about results coming out of the Fermilab accelerator near Chicago. Thanks to an asymmetry in the behavior of neutral B-mesons emerging from proton-antiproton collisions at Fermilab's Tevatron accelerator, the DZero collaboration has found what appears to be preponderance of muons over antimuons in their detector. You should be too  if your taste happens to lean toward esoteric mysteries of the universe. Oh, and if you care about learning at least one of the reasons that you, the world and the cosmos themselves exist at all. One grand mystery of physics, decades old, has to do with the cosmic imbalance between matter (the protons, neutrons, electrons and other particles our atoms are made of) and antimatter (their mirror-image antiprotons, antineutrons and so on that are found almost nowhere). Conventional particle theory says that equal amounts of matter and antimatter should have coalesced out of the intense heat and pressure of the Big Bang, when the universe was a fraction of a second old. That clearly didn't happen, though: when particles meet their antiparticles, they annihilate one another in a burst of energetic gamma rays. Matter-antimatter annihilation is how the Enterprise and other starships can putter around the galaxy in Star Trek. If matter and antimatter had come out even in those first moments, they would have instantly destroyed each other, leaving nothing but energy behind. The mystery, therefore, is why matter of either flavor exists at all. Since it does, theorists figure the Big Bang must have generated just a bit more matter than antimatter, so that when all the annihilating was over, there was enough left to make the galaxies and everything in them. Physicists have been trying for years to identify the mysterious process that led to the initial imbalance. Now, finally, the DZero people may have glimpsed it in action. Accelerators are essentially extremely expensive ways of conducting tiny demolition derbies, propelling particles to near light speed, forcing them to collide and then analyzing the energy and subatomic debris that results. On an infinitesimal scale, those collisions replicate the conditions that prevailed at the dawn of time. The Fermilab team found that in the collisions they conducted, the number of muons (a sort of heavy electron) that resulted exceeded the antimuons. The difference wasn't much  maybe 1%  but that might have been enough to get the universe started. Now the Large Hadron Collider in Europe, designed to be even more powerful than the Tevatron, may be able to probe the phenomenon more deeply, leading to a brand-new, unconventional theory. For a physicist, this is hot stuff. For the rest of us  well, Gustaaf Brooijmans, one of the DZero physicists, tried to make it real by telling the New York Times that the matter-antimatter asymmetry "explain[s] our existence." That's kind of a stretch. It's true that if matter didn't exist, we wouldn't either. But physics has dozens of other unexplained phenomena, from the relative strengths of various forces to the relative masses of various particles to the intensity of the dark energy that pervades the universe. If any one of these had been different from what it actually is, we wouldn't exist either. So to be more accurate, Brooijmans should have said "one of many dozens of factors that explain our existence"  but that wouldn't have made for much of a headline. The truth is that you can't explain why particle physics should excite the average person any more than you can explain why the average person should be moved by Mozart's Requiem or awed by the majesty of the Grand Canyon. Either physics turns you on intellectually or it doesn't. If it does, this is a pretty exciting news. Lemonick is the senior science writer at Climate Central. See history's greatest adventures and explorations. 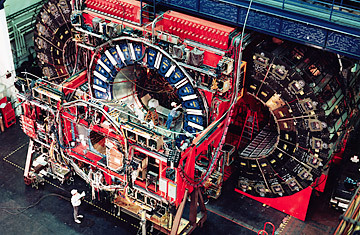 See the top 10 scientific discoveries of 2008.